In Code Black, physician Ryan McGarry gives us unprecedented access to America’s busiest emergency department. Amidst real life-and-death situations, McGarry follows a dedicated team of young doctors-in-training in C-Booth, Los Angeles County Hospital’s legendary trauma bay. The birthplace of emergency medicine, L.A. County Hospital’s “C-Booth” – the critical booth – is a 20-square-foot resuscitation area where more people have died (and lived) than in any other square footage in the United States. 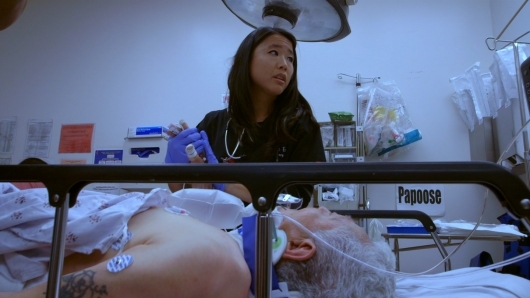 Directed by McGarry, the feature-length documentary is a first-person reflection of his own experiences inside America’s busiest emergency department. Even though it’s set in the tense, frenetic world of emergency medicine, Code Black is less about saving lives and more about saving the American healthcare system. The film starts in 2008, before McGarry and his colleagues move to a new, state-of-the-art building. As the staff leaves behind the old, ill-equipped facility, they find themselves overwhelmed with sick people and the paperwork that accompanies every patient. One physician notes that he spends four times as many hours filling out forms as he does treating patients. McGarry’s film provides a thoughtful and quietly damning appraisal of the American healthcare system. There’s no single culprit to blame here, but rather an acknowledgment that the system is broken and that things must change in order for healthcare professionals to properly attend to the sick. Another doctor notes that thousands of dollars in emergency-room costs might easily be avoided if preventative care were more affordable and widely available. This idea of “socialized medicine” strikes at the heart of the Affordable Care Act and our nation’s inability to come to an agreement on the health insurance debate. Code Black is an interesting documentary from a first-time filmmaker – it’s a compelling subject and there are certainly more than a few harrowing scenes where we see doctors race against the clock to save critically injured patients – but there’s something about the whole film that feels sterile. A documentary should provide thoughtful commentary while documenting events as they unfold, but so much of Code Black is over-produced and staged that it fails to really connect on an emotional level. Interviews with the film’s subjects are filled with flowery statements that are clearly rehearsed, and the film gives too much attention to cost-cutting and overcrowding instead of the intimate dynamic between patient and doctor. McGarry’s film succeeds as a broad indictment of the system, but it’s hard to consider Code Black a powerful work of documentary filmmaking. It’s a realistic look at a world often dramatized on TV, with shows like ER and Grey’s Anatomy, but it’s far too uneven to make the kind of real impact we so desperately need it to. Code Black is now playing in select theaters. For a complete list of screenings and events, please visit the Code Black website. • CBS Unveils Pilot Trailers For ‘Supergirl,’ ‘Limitless,’ More!